Nowadays it seems like you can shop for almost anything online and even have your items shipped in as little as a few days for free (or close to it), all within a few finger clicks or swipes. As such, bargains on the Internet abound seemingly every week, and both casual and avid shoppers eagerly await upcoming notifications for the best prices out there. So it goes without saying, why not shop online for pasalubongs and bilins for your family and friends? Get everyone involved – This way you prevent miscommunication and avoid the pressure of shopping for hard-to-shop-for friends and family members. Loved ones can choose the exact product(s) they want online and then ship the items to you. If time permits, you can check them out for them at the brick and mortar stores just to make sure that the product is exactly what he/she wants. Clothing purchases come to mind because people still want to touch, feel, and see the said items. Also, you can bring friends who are similar in size and build to members of your family whom you’re shopping for. Moreover, you can even video chat with the loved whom you are shopping for so he/she can also “shop” alongside you, or you can record short video snippets and send them using your preferred social messaging app like Instagram, Facebook, Snapchat, and WhatsApp. Lastly, make final purchases then and there at the stores or online, whichever has the best price and availability. More convenient – Smartphones and other mobile devices make shopping as easy as possible anytime and anywhere you have an Internet connection. Retailers have ensured that your online account is synced across all devices including your laptop/desktop. Additionally, you can even shop online using your laptop while on video chat! With Skype, you can even share your screen so you and your loved one can order exactly what he/she wants. If you happen to receive the product or perhaps even a damaged one, you or your loved one can initiate returns easily and receive the replacement in no time at all. For visitors and tourists, especially those staying for an extended period of time, take advantage of the online shopping, too, by sending your purchases using a balikbayan box. You need not worry about making all of them fit in your suitcases, thereby avoiding the temptation to buy additional luggage. Lessen shipping costs – Airline companies have enforced stricter baggage guidelines and higher baggage fees, limiting (and deterring) what passengers can bring onboard, especially those traveling internationally. Avoid the hassle and the potential excessive expense by sending your bilins and pasalubongs in a balikbayan box or two. 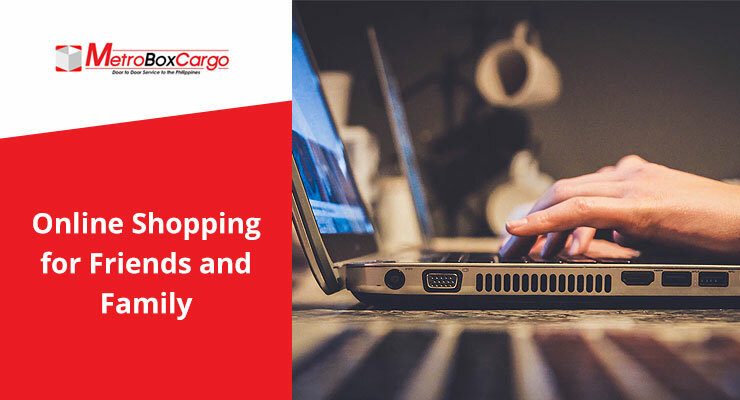 Sending your pasalubongs and pabilins by balikbayan box(es) with your preferred freight forwarding shipper is still the most cost-effective way. Consolidate receiving and shipping of ordered items in one location or through one person such as yourself. Once you receive all of the expected items, you can now pack the balikbayan box(es). Check out our previous blogs on tips to properly pack and ship your box(es), as well as what can or cannot be included in the box. In summary, online shopping provides a win-win situation for yourself, your family and your friends when it comes to pasalubongs and bilins. It’s easy and convenient. It saves time and money, and most of all, it gives you peace of mind that everyone is happy that they will be getting exactly what they want and expect to receive when the balikbayan box arrives at their doorstep. On that note, happy shopping everyone! Metro Box Cargo is a freight forwarding services company established in 2013 with two main offices – at Hayward, CA in the United States and at Teachers Village in Quezon City in the Philippines. Founded by Egay Tajonera, and his wife Mabelle, they are passionate in providing exceptional service to the Filipino community. Our company provides personalized, reliable, on-time customized door to door service for balikbayan boxes, container shipments, loose cargo and odd-sizes shipments. We also offer vehicle shipping services for cars and motorcycles. Our friendly and helpful staff, as well as our authorized agents, are available to assist you and answer questions you may have. We have locations in northern and southern California: our two main warehouses are located in Hayward and Santa Fe Springs, and our five drop off locations can be found inside Island Pacific stores. Feel free to call or stop by. Please visit our website at www.metroboxcargo.com for more details. SF Bay Area Residents – we have a special ongoing promo for you!